The Yielded Quill: You're Invited! 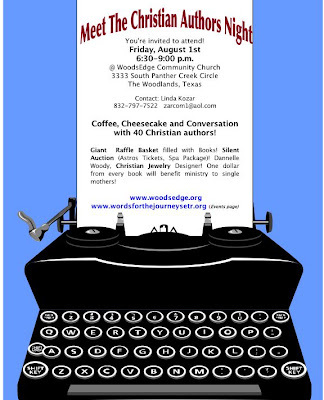 musical entertainment, a Christian jewelry table, silent auction, raffle and refreshments. Don M. Aycock, Linda & Steve Bauer, Alison Bottke, Terry Burns, Lena Nelson Dooley, Leanna Ellis, Dorothy Feartherling, Marcia Gruver, Anita Higman, Charlotte Holt, Nancy Jo Jenkins, Eileen Key, Linda Kozar, Jeff LeJeune, Elizabeth Ludwig, Cathy Messecar, DiAnn Mills, Randi Morrow, Janelle Mowery, Kim O'Brien, Susan Titus Osborne, Allison Pittman, Karen Porter, Deb Raney, Jerry Rassamni, Deborah Rather, Martha Rogers, Carla Rossi, Lynette Sowell, Donn Taylor, Janice Thompson, Sharen Watson, Carol Weishampel, Brenda White, Nancy Williams, Kathleen Y'Barbo, and Julie Johnston Zick.